more years ago than i can correctly recall, rapha released a series of compact discs designed to accompany the three grand tours: the giro, the tour and the vuelta. each contained a selection of curated songs native to the countries in which each tour takes place. it has to be said that many of the tracks appeared to have been drawn from the fringes of 'euro-pop' and not always the sort of music you'd have chosen by your own volition. however, i do remember a particular track on the giro cd on which the repeated refrain revolved around walking a mile in someone's shoes. it's not an uncommon phrase, even in this country, though rarely does it actually have anything specifically to do with shoes. or even feet. as cyclists, shoes form an intrinsic part of our armour, arguably something of a boutique part of late, but considering the demands imposed upon them, appropriate footwear can make a substantial difference to the quality and enjoyment of a bike ride. though the brand shall remain nameless (but not rapha), the choice of shoes in which i opted to ride from london to paris in 2017, was definitely not my (or their) finest moment. i chose to ride in a pair of offroad shoes, those on which the small cleats are recessed into the sole. having previously ridden on the three-point cleats beloved of roadies worldwide, when the situation demanded having to walk for a living, not only were the plastic cleats at greater risk of damage, we all know which species of birdlife we most closely resemble. the problem, in retrospect, was the inherent flexibility of the soles. they were quite ideal for the often shorter rides around the locality, but impose three successive 160km + days and i don't mind telling you it took more than a year before my big toes fully regained feeling. if that didn't offer up something of a clue as to one of shoe-life's necessities, then probably nothing will. so yes, one of the most ideal features of any cycling footwear, is a finely judged stiffness of sole. when it comes to offroad shoes, that has also to be offset against a certain degree of compliance. after all, it's not solely (pun intended) the cleats that make road shoes awkward to walk in. ostensibly there is less requirement to 'put the power down' offroad, than elia viviani would have you believe. let's face it, if these are factors that have occurred to me when considering a new pair of cycling shoes, you can bet your pink and black silk scarf that rapha had the same concepts on the board when creating their newly released footwear options. 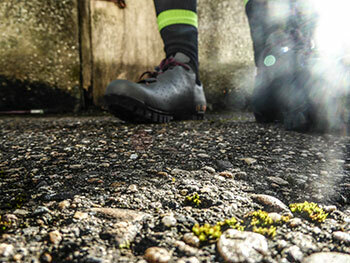 while both road and offroad options are on the website right this minute, it is the latter that have caressed my tootsies for the past couple of weeks, subtly camouflaged in a dark olive green uppers, married to a downward facing chunky rubber tread. previous rapha offerings have been the result of a partnership between imperial works and giro; the new ranges have been developed in-house, principally at the expert hands of rapha designer, joel salamin. i'm not sure if it's necessary to offer a spoiler alert at this point, but i think i probably ought to in case you're in a hurry. these are quite probably the most comfortable shoes it has ever been my pleasure to wear. i can't be the only one who often finds brand-new shoes to feature hidden pockets of discomfort, many of which snap at your heels, just when you really wish they wouldn't. rapha's explore shoes have done no such thing; in fact, on each and every ride, i have completely forgotten i was wearing them. aside from impressively comfortable insoles, the shoes arrived in their cloth bag along with a spare pair of laces and two adjustable arch-supports which i placed under that insole for every last gramme of comfort available. as to the laces, a set of dark grey was in place when i opened the box, which were immediately swapped for the red and black option in the bag. i am nothing if not a style icon. 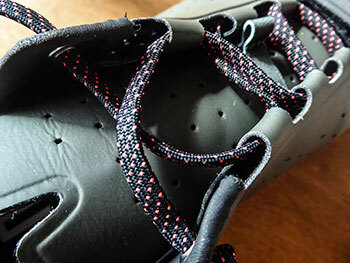 and while we're on the subject of laces, rather than being threaded through eyelets on the shoe uppers, the latter folds back on itself, creating a double-wall and through which the laces are manouevred. once tied, the lace-ends can be held in place under a small elastic strap, midway along the tongue. alternatively, a velcro strap above the toe box can be employed for the same reason, if required. 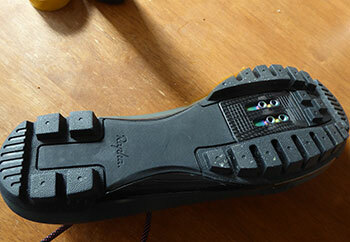 the soles are impressively chunky, remarkably similar to those you'd find on a pair of 'cross compatible shoes. 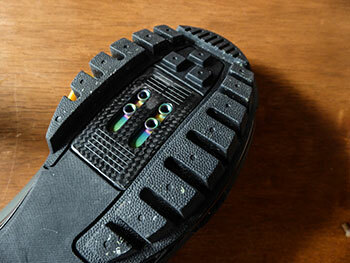 and with reference to the latter, there is no provision for toe studs as frequently found on offroad shoes. however, the word explore in the title gives credence to a purpose that doesn't necessarily involve shouldering the bike to run up a muddy incline in heated pursuit of wout van aert. a carbon plate, visible surrounding the cleat mounting, stops short of both toe and reflective heel, providing the stiffness mentioned above, yet allowing a walking compliance for which we must be truly grateful. 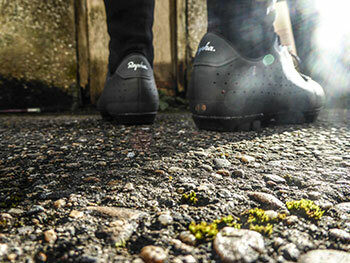 rapha were kind enough to send a pair of the explore shoes because, at this time of year, treading wet grass verges and climbing out of roadside ditches is well nigh impossible in smooth soled road shoes. and if i'm perfectly honest, that's also a state of affairs every bit as pertinent across the rest of the year. though i fitted a pair of ritchey cleats to match the ritchey offroad pedals affixed to the bicycle selected for the duration of my review, the titanium cleat mounts will naturally accept any two-bolt compatible cleats. rapha's sideways move into 'riding until the road becomes unfamiliar', inspired, i'll warrant, by the original rapha continental, has spawned an entire range of clothing, including the now infamous pocketed cargo shorts, bikepacks and now footwear, with which, it seems, they have hit the ground running. a price of £220 likely comes under the realm of 'reassuringly expensive', but on the basis of my own experience with the explore shoes, entirely justifiable. now, if you'll excuse me, my feet are encouraging me to explore further. 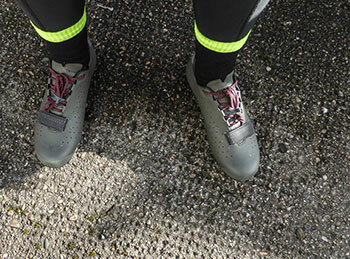 rapha's explore shoes are available in black, black pearl, dark green and the inevitable hi viz pink. weight is a claimed 300g (size 42) and are available at a retail price of £220. though i have not had the pleasure of wearing the 'classic' road shoes, they are offered in white, black, back pearl, hi-viz pink and an rcc edition. sizes for both styles range from 38 to 48 including half sizes.